For fast, safe and easy vinyl transportation Rockbag has now updated their DJ Record Bags for you. For all those of you who miss the security of a case but do not like the weight of it, here comes the solution! The sturdy metal carabiner, a wide padding, a reinforced bottom and strong plastic insertions protect your precious vinyl. The plastic insertions are removable so that the bag can be stored in a corner. The Record Bag with is made from waterproof RokTex® material with overlaping flaps so rain storms are no problem. The outside pocket can be used to store your headphones, cables or anything else, making sure you always have everything you need for your performance. 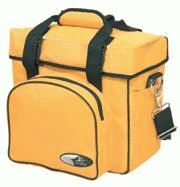 The Record Bag is available for 10, 20 and 50 records and in the colors red, yellow, blue and black.